“Banothando” is the is Zulu word for the shared loving feeling of a community. The title for this work came from one of the project participants when describing what links the people of the Early Morning market with each other. “banothando” is a follow up of the collaboration between Mexican artist Lilia Pérez and dala that started with the interactive installation, Sawubona, produced in Amsterdam. 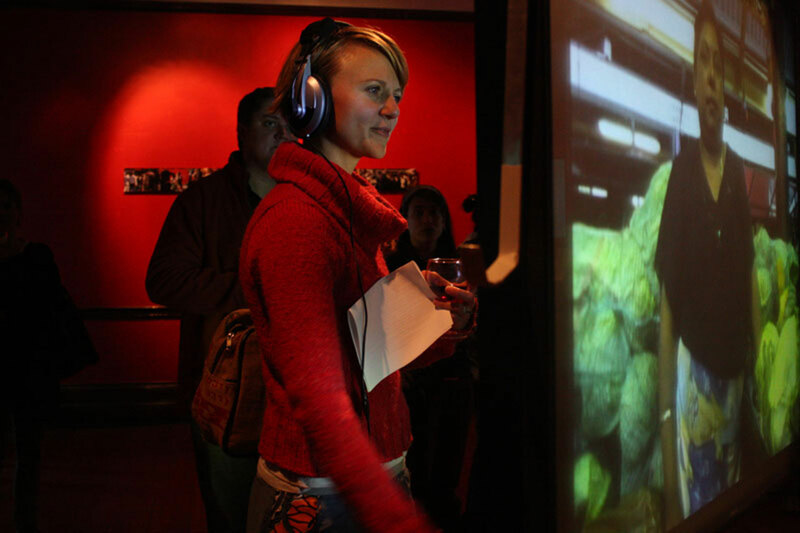 It constitutes a series of interactive portraits that use physical contact between people and images of people as an interface to the stories gathered by Rike and Lilia during the world cup and immediately after it when the general enthusiasm mixed with uncertainty about the future of the market traders’ livelihoods. When the spectator approaches “banothando”, she will be confronted with one of the market traders, observing her from the projected image of their market stand surrounded by the merchandise they sell. From this pose and the framing of the shot, the character seems to be waiting for a customer. The character will carry on like this, breathing and blinking, sometimes smiling until the spectator touches the screen. As soon as contact is made, the character starts moving, responding with the same gesture, placing her hand and gaze on the user’s hand, following any route it follows. While the virtual and the present hand touch, the spectator will be able to listen to the trader’s stories about the market, life in general and the effect of the world cup in their life and surroundings. When the contact stops, the character will become silent again. Trapped in this small sequence of gestures the character and the viewer meet one another in an instant of simulated communion. Physical contact, so natural for the market traders amongst each other, but so rare between the predominantly Indian and Zulu traders, and the very often white visitors of the gallery, becomes a condition for communication as well as an ingredient for emphatic listening.